ASICS has recently launched 3 new models sporting its FlyteFoam midsole technology, namely the ASICS DS Trainer 22 (replacing DS Trainer 21), ASICS Noosa FF (replacing the Noosa Tri), and the Dynaflyte which was already released last year but sees a colour update this year. In case you have not been up to speed on ASICS's progress with FlyteFoam, this material first debuted in the exclusive and very pricey MetaRun, which I reviewed earlier in Dec 2015. The technology made a big splash in the daily trainer category with the Dynaflyte last year, and continues to build on that with its incorporation into the DS Trainer and Noosa Tri lines. On a personal note, ASICS have fitted me with the Noosa FF and initial run feedback is very good. This maybe my favourite ASICS trainer to date. It's not the lightest of the new FlyteFoam shoes; that honour goes to the new DS Trainer 22, as it used the lighter FlyteFoam midsole to drop a full ounce from version 21 and making it a serious threat to New Balance's 1500v3 as a stability racer/trainer. However, the Noosa FF gives a nice bouncy ride while still having enough pop in the forefoot to allow you to pick up the pace without feeling like you are fighting the shoe. I'll continue to form my impressions as i clock more miles in the shoe, and will post up a review on this shoe real soon! To help store visitors find the right shoe for their needs, ASICS flagships worldwide use FOOT ID and Gait Analysis technology to provide advice based on specific running patterns and pronation types. In-store experts also coach runners of all levels on which shoe fits their running style, and share tips on training for a customized running experience. These experts are equipped with the most up-to-date information on ASICS new releases, including the next-generation FlyteFoam series. The NOOSA FF, GEL-DS TRAINER 22 and updated DynaFlyte are ASICS’ newest products featuring FlyteFoam, ASICS’ patented midsole technology first introduced in concept shoe MetaRun in 2015. In conjunction with the launch of the ASICS FlyteFoam Series, ASICS invites all the run enthusiasts to join a run challenge of the year, Unlock The Fast, Saturday, 1 April 2017 and Sunday, 2 April 2017 from 11am to 8pm at SUNTEC City West Atrium (outside Sephora/ Uniqlo). Participants must come in a group of 3. Each team member will wear one of the trial pairs from FlyteFoam Series and each individual member of the team that clocks the most mileage within 5 mins for each day gets to walk away with a pair of running shoes from the FlyteFoam Fast Series. Alongside the FlyteFoam Fast Series, ASICS introduces Pace Academy, a series of Runkeeper workouts, pro tips, and inspiration from top athletes. ASICS Pace Academy will serve as a platform to help runners improve their speed. Within the Runkeeper app, workouts will be tailored to each runner’s ability, complete with audio coaching. ASICS Pace Academy will be available on the Runkeeper app from mid-April in English and from mid-May in other languages. All three models of the FlyteFoam Series will be available for men and women at ASICS stores and select running outlets worldwide from March 2017. The NOOSA FF will retail for 199 SGD, the GEL-DS TRAINER 22 will retail for 199 SGD and the DynaFlyte will retail for 229 SGD. Join the conversation on FAST with the #FlyteFoam and #DontRunFly hashtags. I noticed on another website (roadtrailrun) you briefly started a review of the Asics dynaflyte. Just wondering do you have the full review of it at all? How does the asics Noosa compare? Thanks. 1) the upper is simply too warm for Singapore weather for me, and that heat really starts to build up in the shoe after the 90min mark. 2) while the shoe worked fine up to 20km for training, i failed on several attempts to get it to survive a proper long run. I got pretty sure beyond the 90-100min mark in my quads with this shoe. Hence, beyond the initial review, there really wasn't much to add. 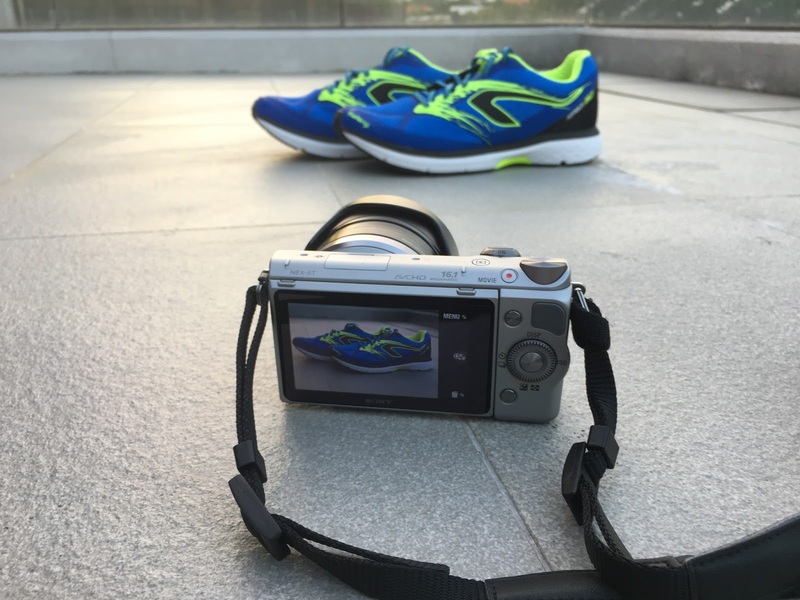 Overall, the shoe has good durability and the characterisics of bounce and grip did not change much and i have about 300km in the shoe to date, though i hardly use it anymore as there are more ventilated options which suit me better. as for the Noosa FF, it's a little too early to say, but it feels noticeably softer than the dynaflyte and a bit more flexible overall. The upper is also much much more ventilated (as it's a triathlon shoe). The Noosa FF is also about an ounce lighter than the Dynaflyte so that's a big bonus. I will be doing a full review of this shoe in about 2-3 weeks. Thanks for update. A few questions as the Dynaflyte as its on sale at the moment. I only tried the dynaflyte for about 10 minutes, It seemed quite soft to me, Nearly like Adidas ultra boost. Thoughts - I hate hard or to firm a shoe (heel and back issues)? It seem quite responsive and fast too? Better that Adidas ultraboost/or Noosa FF? Did you find did it have very good cushioning damping quality's. I do have the saucony iso 3 for long distances and like it a lot (great cushioning an responsive). I am looking for a comfortable short distance shoe (up to 10kmh)?. Where I live it averages 20-30 c (70-90) and low humidity. Would the dynaflyte be okay for those climates, distances and is it comfortable? Why didn't it last for along runs? How would it compare to the saucony, Adidas boost, Brooks Glycerin, many thanks. Honestly I felt that the initial softness is from the ortholite insole, and does go away once the insole beds in. For your running conditions and distance aims, I think the new Kinvara 8 (or an old Kinvara 5/6 if you can find them) or even the Adidas Boston 6 (not Boston 5) would be a better option. The Brooks Pureflow is also a possibility if you are looking for closeout deals. Hi. I recently did a half ironman in the DynaFlyte. It was a hot humid day and I was using a lot of sponges to cool down at the water tables. These did a good job at cooling me down but it meant my feet were squelching in sopping wet shoes for almost the entire 21k's (this did alleviate the excessive heat I feel in the shoe as your review states). 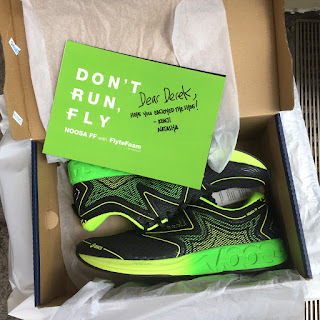 My question is... do you feel that the Noosa FF will be able to get rid of water quicker than the DynaFlyte (especially in the to box)? Are there water drainage holes etc? Also, what is the difference in cushioning between the two (mm's)? thanks very much! The upper is definitely more ventilated. I can actually feel my feet cooling when running into a breeze. I did not see any drain holes in this model. The insole does have perforations but I'm not sure that helps a lot with getting rid of excess water. I can tell you the upper material should retain very little water. Thickness wise, both shoes are quite similar, except the NoosaFF has a 10mm drop while the Dynaflyte is 8mm. I do find the Noosa softer in the forefoot than the Dynaflyte, at least for now. I only have about 35km in the shoes so far. I found the Dynaflyte to be more of an uptempo type of shoe. Just did a long run with the Noosa FF over the weekend, and I am now very sure that the Noosa is softer both in forefoot and heel. I could not tolerate the Dynaflyte for more than 20km at training paces. Of course, softness and firmness are all quite relative. If you felt that dynaflyte was soft enough as a short run shoe for you then it should work fine. Both Dynaflyte and Noosa FF are firmer than the Triumph. I did try the Dynaflyte with different insoles and it didn't make much of a difference to the heat build-up, more of a slight change in the ride. The gel insole made the shoe a little firmer. Also, the same foam can be tuned to different firmness levels, and it often is too. So two shoes using the same "Flytefoam" or "powergrid" or "Solyte" or "BioMoGo" EVA can all feel very different, so you can't really assume two shoes will be similar just because they use the same midsole material unfortunately. Thanks Derek very helpful especially since you own both shoes. Just so I understand the two main issues you found one was the overheating issue and secondly to firm ? over 20kmh - is that correct. Interesting some comments I've read said its fairly soft and I think you made a comment that some may find it a little soft for uptempo work (under initial impressions). So you found the Dynaflyte a more uptempo shoe than the Noosa - more responsive? Out of interest how would you compare the saucony triumph iso 3 to the Asics Noosa for comfort, response, breathability etc. Sorry for all the questions as I trying to make a decision this week - many thanks for putting up with all my questions. Thanks Derek very helpful especially since you own both shoes. Just so I understand the two main issues you found with the Dynaflyte was one was the overheating issue and secondly to firm ? over 20kmh - is that correct. Interesting some comments I've read said its fairly soft and I think you made a comment that some may find it a little soft for uptempo work (under initial impressions). I found the shoe to beat me up a bit past the 20km mark. I can't run at 20kmh for more than 1 minute or two. Yes, in the initial impressions I thought it might be too soft for uptempo work, but after putting more miles in, the shoe started to lose the initial softness and got a bit firmer and more responsive. So in summary yes, the main gripes are the overheating and the firmness. Yes the Dynaflyte is firmer and more responsive than the Noosa in all aspects, however the Noosa is also lighter than the Dynaflyte so it ends up being pretty close if you are looking for an uptempo type of shoe. I only have the Triumph ISO2. The Triumph upper is generally more stretchy and comfortable, though not as breathable as the Noosa. The Triumph is significantly softer across the board than the Noosa, and less responsive as a result. I believe it was the insole that lost its softness. Some shoes get softer after a few runs; that's the breaking in process, and not all shoes undergo breaking in. After 30-40 runs, the same shoe can get firmer and feel more dead; that's the midsole wearing out, and will happen eventually for all EVA foams. I did not put in that many runs to wear out the Dynaflyte, so i think it was more of the insole losing its cushioning, though i did try several other insoles, without getting back much of the initial softness of the shoe. I am looking forward to the Noosa review, has it lost some its softness after a few runs, is it the same insole as the Dynaflyte. Any negatives on the Noosa so far. Would you say the Noosa is just a touch softer or considerable softer than the Dynaflyte. Cushioning/shock absorbing levels similar ? No the insole is different. Noosa uses a perforated ASICS insole. Dynaflyte used an Ortholite insole, although i've tried the Dynaflyte with Brooks and ASICS insoles without a whole lot of improvement. I would say the Noosa is considerably softer. Closer maybe to a Saucony Kinvara (any model other than 7) or a Nike Pegasus 33. I was wary to try more Triumphs, as at that weight, i would rather go full maximal and get a Hoka Vanquish or Clifton. Thanks for all your help. Have a good day. I would say the Noosa is a very good all-rounder. As for weaknesses, the upper is a bit stiff, especially around the ankle but it's not a big deal. I like stretchy less structured uppers in general, but that's more of a personal preference. I checked both of them out today (Asics Noosa and Dynaflyte). Is it the inner sole that got firmer or the sole of the shoe. I know my saucony iso 3 softened up after a few runs. I would of thought shoes tend to go a little softer over time when they get worn in but I maybe wrong. Would like more infos on gel ds 22-23 pls. My mates in the UK uses them for half and the London marathons, are they meant for doing the full Monty? My thoughts were they just for 10 - 21 kms max. I'm just a novice runner just getting into long distance running. Esp ultras.